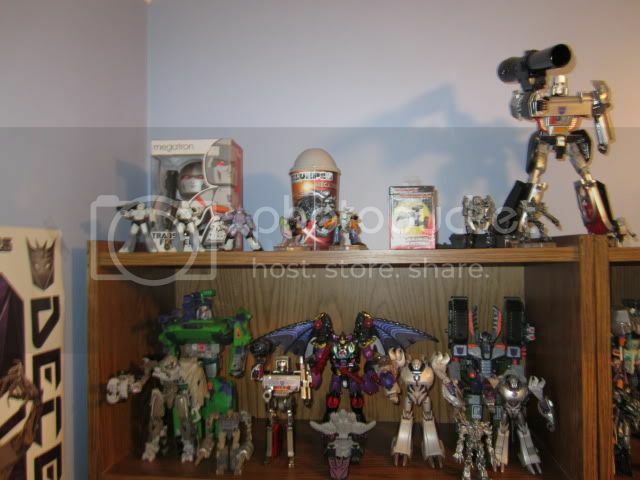 Seibertron.com Energon Pub Forums • My Optimus Prime/ Megatron Collection: Fresh Video 4/9/12! 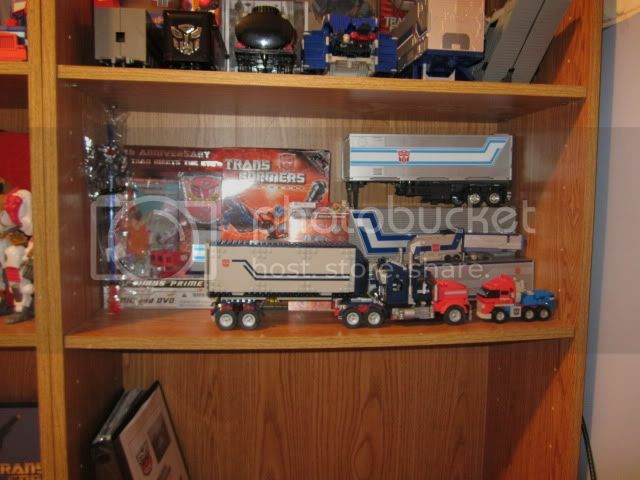 My Optimus Prime/ Megatron Collection: Fresh Video 4/9/12! Motto: "Just a few more to go and the collection will be complete honey...I promise." 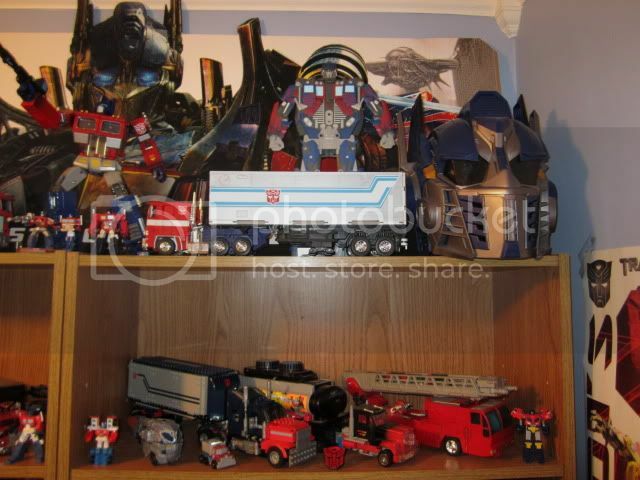 Here is my Optimus Prime/ Megatron collection with my other Transformers as well. Enjoy! Check out the video below for the collection up to date! Last edited by Autobot Joe on Fri May 04, 2012 5:40 pm, edited 7 times in total. *Bump* Plus I added some stills. Motto: "You don't know because you can't see me. Then you are dead." Nice display. It's interesting that you have a lot of your Primes in alt mode. Usually people display in bot mode. Motto: ""A high speed pursuit is just my style""
this somehow makes me wish i still had armada megatron/optimus. anyway, what was that white and yellow truck? if it's optimus i never saw him look like that! Megatron lives on in all ages of time and space! 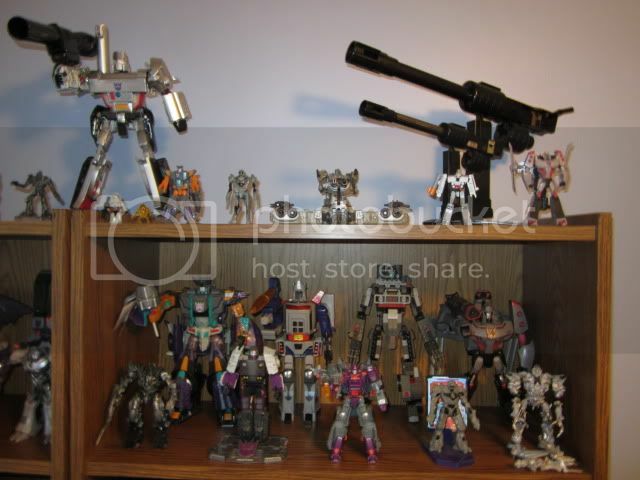 mechabot wrote: this somehow makes me wish i still had armada megatron/optimus. 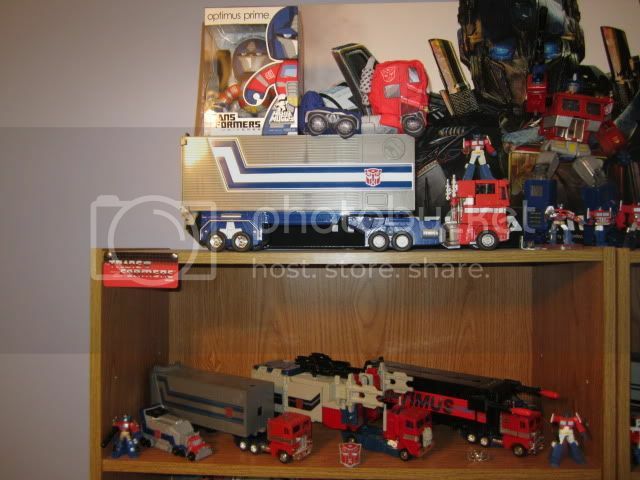 If you are talking about the white and yellow truck between First Strike Optimus and WFC Optimus, it is a version from G2. 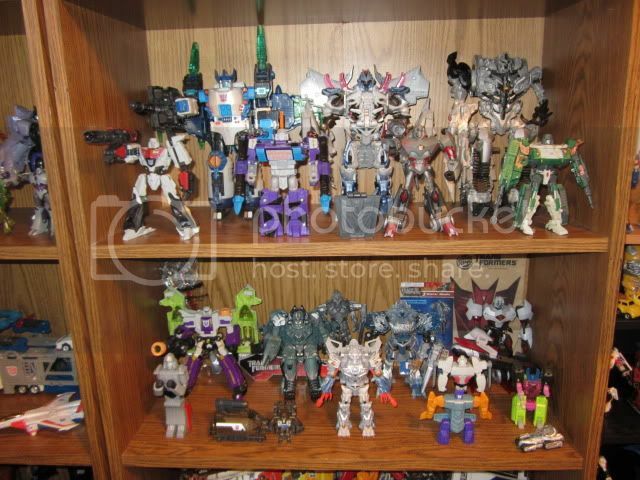 The Megatron from this same series is the purple tank. Armada had some interesting figures. Can't say I'm a big fan of Minicons, but I have to admit that Armada Megatron is one of my favorites as far as the toys go. SJ21 wrote: Nice display. 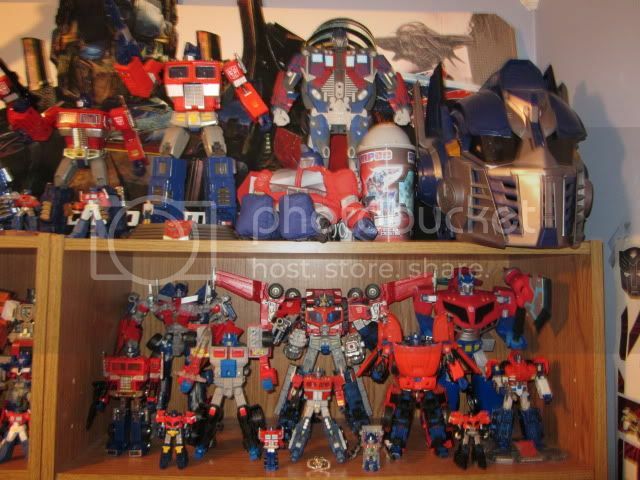 It's interesting that you have a lot of your Primes in alt mode. Usually people display in bot mode. I'll be updating the pics and a video soon. 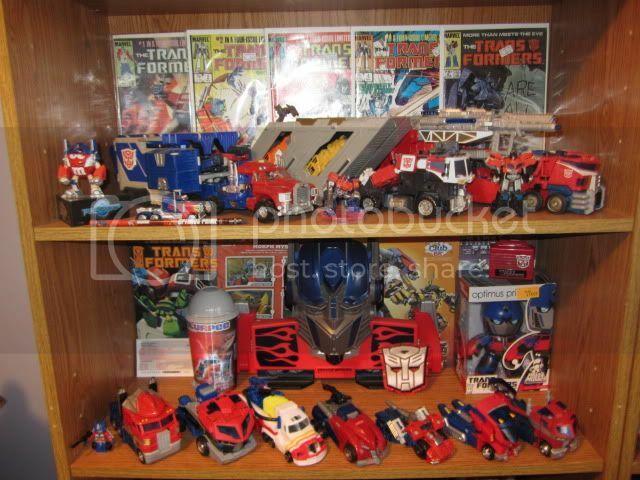 I've added a few TF: Prime figures and MP-10 Convoy (OP) to the collection. Just waiting for a few more before I update. Added current pics and video. Enjoy. Wow...that...that's a lot of trailers. 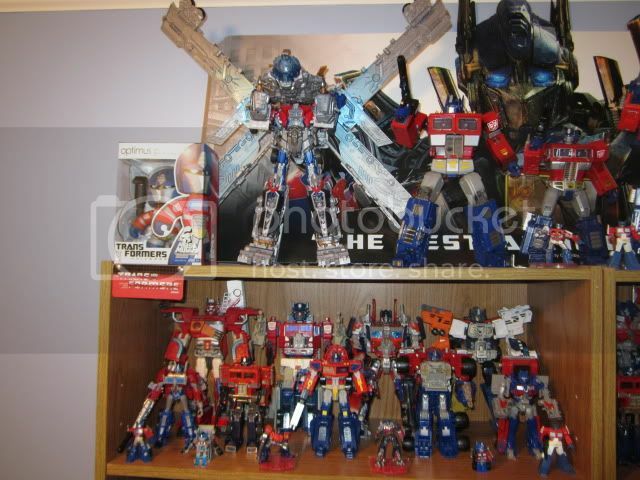 I'm liking your collection a lot, especially your Optimus collection, though I personally HATE Leo Prime. He's such a cheap imitation and an insult to Lio Convoy. I sold mine one month after acquiring it. 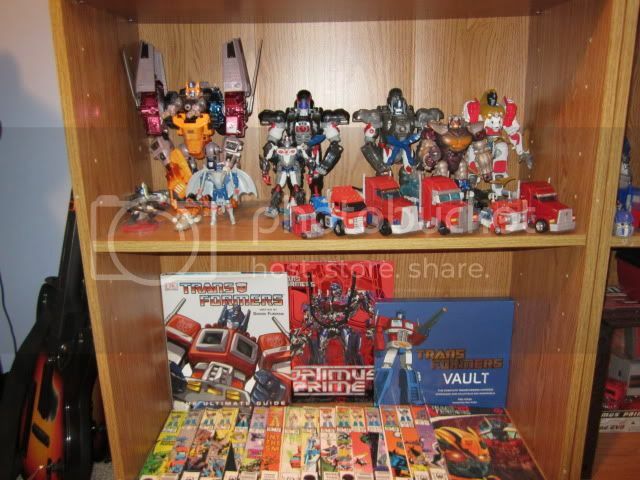 Thats a awesome way to dislay your collection! 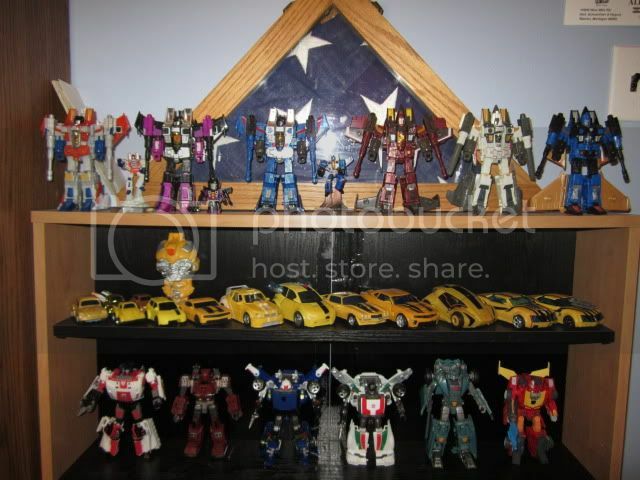 TulioDude wrote: Thats a awesome way to dislay your collection! 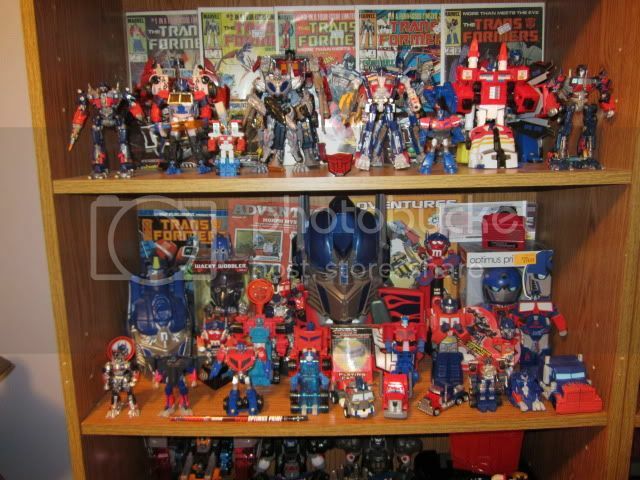 Sweet collection! That's a lot of Primes. Different to see them all in truck mode. I like it. Alot! Wierd to have a Decepticon so into my Primes...lol. Thanks! 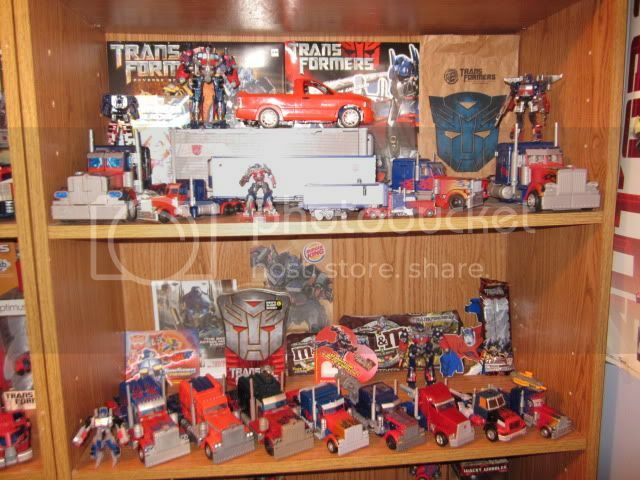 Re: My Optimus Prime/ Megatron Collection: Fresh Video 4/9/12! Just added the Fansproject G3 trailer to my collection. Enjoy. 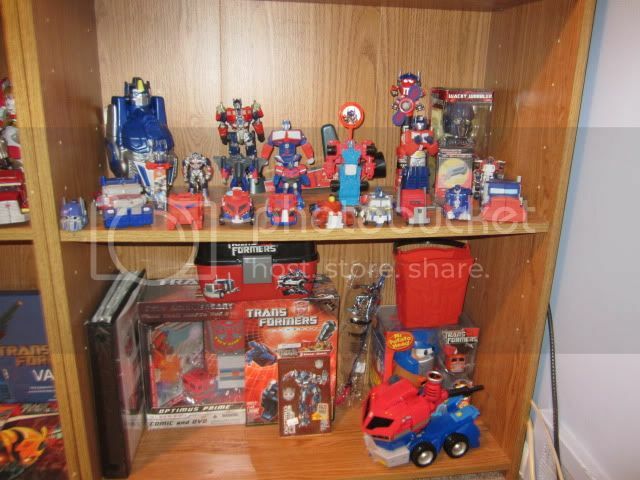 Definitely an Optimus fan. No doubt about it. lol. 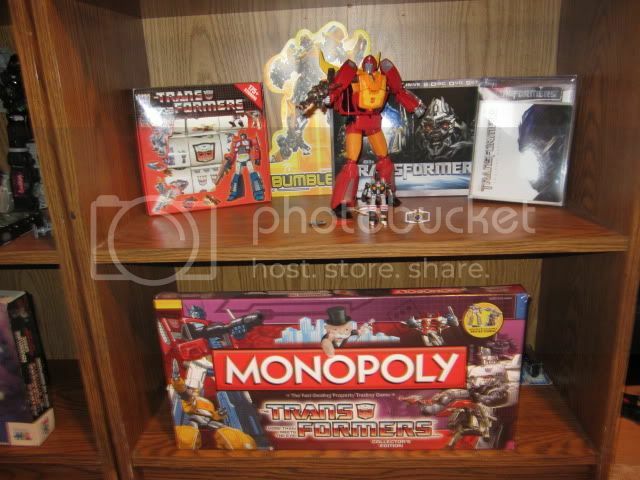 Rodimus Prime wrote: Holy. F**king. ****. 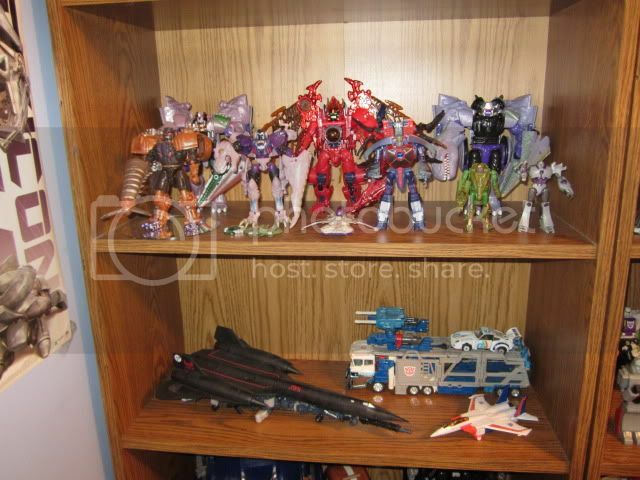 autobot joe wrote: Here is my Optimus Prime/ Megatron collection with my other Transformers as well. Enjoy! 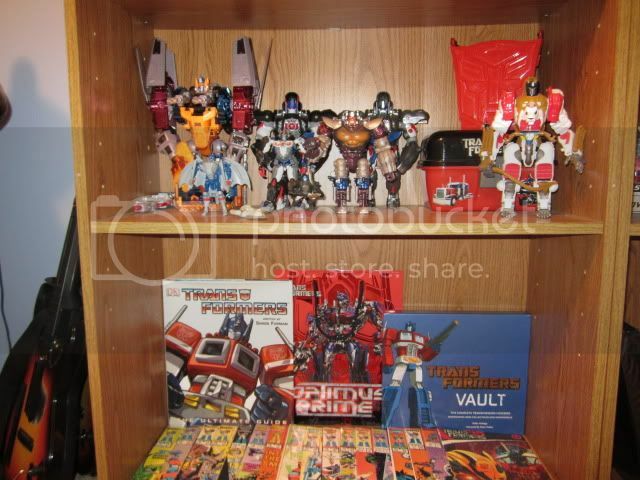 nice display for Optimus! 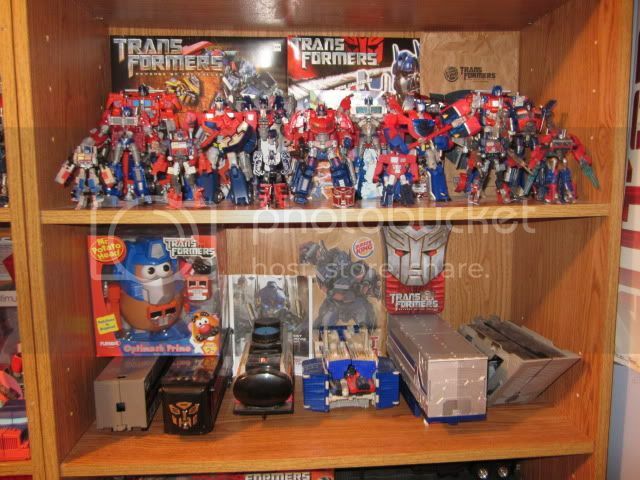 make sme want to take pics of my Optimus figures, I certainly will never have that many! I'm more into getting alot of different vehicles. but I do like Optimus's Truck and Trailer forms. Quick update: MP Roddy and Classics Magnus have left the building. Hopefully the guy who bouth them provides a good home. 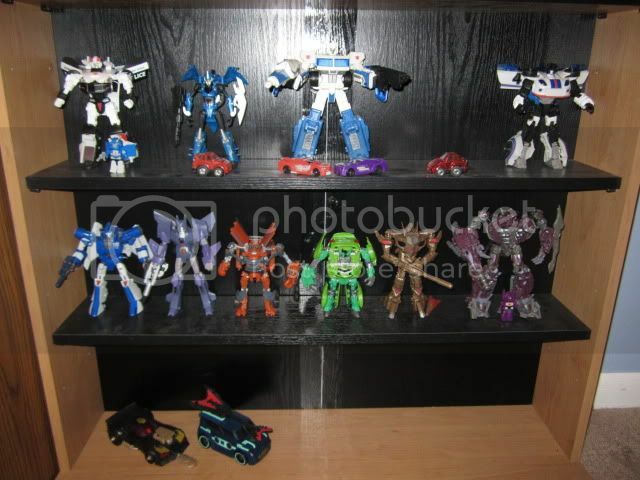 Im just waiting on a few PRID Decepticons to hit the shelves, including the Vehicons, to do a full update. Hope everyone had a great 4th of July. 4,757 pages were recently viewed by 570 unique visitors. This page was viewed 1 times on Friday, April 26th 2019 1:03am CDT. © 2019 Seibertron, Inc. DBA Seibertron.com. All Rights Reserved. Established June 2000. Seibertron.com is owned by Ryan Yzquierdo.